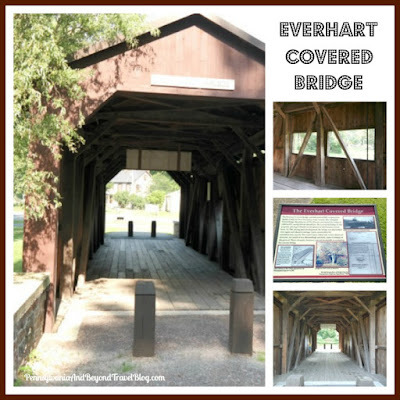 The historic Everhart Covered Bridge is located at Fort Hunter Mansion and Park in Harrisburg, Pennsylvania. Although this is its current location, it was originally located at Little Buffalo Creek in Perry County and was built in 1881. The covered bridge was scheduled to be demolished when Margaret Wister Meigs purchased it for $70.00 in 1940 to save it. The bridge was then dismantled and moved to Fort Hunter Mansion, right in the front yard. In 1980 the bridge was once again dismantled and this time it was put into storage for several years. Once Fort Hunter Park was constructed, it was moved to it's current location on the property. To see the bridge you'll want to head to the Fort Hunter Mansion and Park in Harrisburg. Once there, you'll find two large parking lots. The one parking lot is located in front of the mansion and right along the Susquehanna River. If you park in that lot, you'll have to take the crosswalk to get across Front Street and into the other area of the park. The second large parking lot sits right behind Centennial Barn and that's where you'll actually find the Everhart Wooden Covered Bridge. You'll want to park your car and just follow the marked path's or sidewalk up to the bridge. It's a short, easy walk. Right before the bridge you'll find the historical plaque that gives you the history and information about the bridge. The Everhart Covered Bridge was built in 1881 to span the Little Buffalo Creek in Oliver Township, Perry County. Mrs. Margaret Wister Meigs, the preserver of the Fort Hunter purchased the bridge in 1940 for $70. saving it from demolition. She moved the bridge to this property placing it directly on the ground of the mansion's front lawn. In 1980 during the park development the bridge was dismantled once again and placed in storage. Upon examination for reconstruction, experts discovered many rotted and ruined structural elements, the result of two dismantling and forty years of resting on the ground. These elements however, proved invaluable in the recreating the current bridge. On the information plaque you'll also see two photographs of the bridge, a copy of the cartoon of Mrs. Meigs that appeared in the Philadelphia Inquirer in 1941 and a copy of the sales agreement. It's worth the stop to read all of the given information. We had the opportunity to check out the Everhart Covered Bridge while spending some time at Fort Hunter Mansion and Park. If you want to take a tour of the mansion, you'll have to pay a small admission fee for that. Otherwise, we were table to walk around the Mansion's gardens for free, let our grandchildren play at the playground for free and just enjoy being outside and walking around their beautiful walking paths. Throughout the year the Dauphin County, Parks and Recreation Department (they own and operate Fort Hunter Mansion and Park), host various events which are open to the public. Some of the events are free to attend and with other's there is an admission fee. You can learn more about it by visiting their website online. I think it is wonderful that Mrs. Meigs took the step to save the bridge and purchased it. I would love to go to the park and see it some day.